In 2018 Fox 13 attended our event at the ArtsXchange and spoke to Equal Pay Day Chair Kristin Smith as well as Parliamentarian and Equal Pay Day Committee Member Tami Simms. WHAT: To recognize National Equal Pay Day and to raise awareness of pay equity and wage discrimination, Business and Professional Women (BPW)/St. 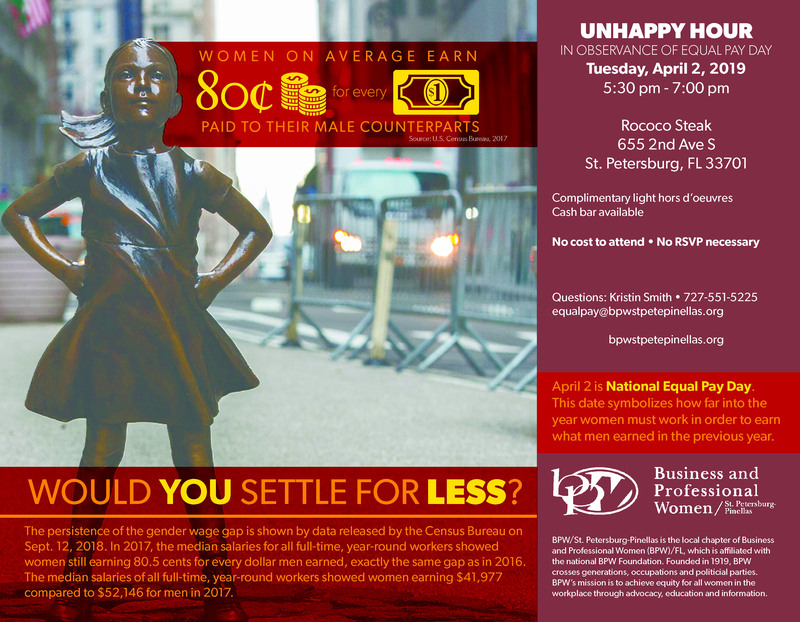 Petersburg-Pinellas will hold its 16th annual “Unhappy Hour” on Tuesday April 2, the symbolic day that the average woman in the United States finally earns the same amount of pay that her male counterpart earned in the previous calendar year. According to data released by the U.S. Census Bureau in September 2018, the average woman makes just 80.5 cents for every dollar a man is paid, reflecting a gap that results in hundreds of thousands of dollars in lost wages over the course of a career. Median salaries of all full-time, year-round workers showed women earned an average of $41,977 compared to men’s $52,146 in 2017. WHEN: Tuesday, April 2, 2019, 5:30 to 7:00 p.m. COST: The public is invited to attend this free event. No RSVP is necessary. Light appetizers and a cash bar will be available. ABOUT: According to the U.S. Department of Labor, when the Equal Pay Act was signed into law by President John F. Kennedy in 1963, women were earning an average of 59 cents on the dollar compared to men. While women hold nearly half of today’s jobs, and their earnings account for a significant portion of the household income that sustains the financial well-being of their families, they are still experiencing a gap in pay compared to men’s wages for similar work. For women of color, the pay gap is even greater. African American women average only 63 cents, and Hispanic women are typically paid only 54 cents for every dollar paid to male workers. At the current rate of change, the Institute for Women’s Policy Research has estimated that the wage gap will not close until 2059. BPW/St. 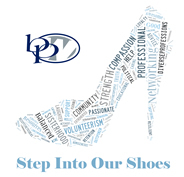 Petersburg-Pinellas is the local chapter of BPW/Florida, which is affiliated with the national BPW Foundation. Founded in 1919 at the national and state levels, and in 1966 at the local level, BPW crosses generations, occupations and political parties. BPW’s mission is to achieve equity for all women in the workplace through advocacy, education and information. General membership meetings are held on the first and third Thursdays of each month at 400 Beach Seafood and Tap House in Downtown St. Petersburg. Each year, we hold an “Unhappy Hour” to recognize National Equal Pay Day and to raise awareness of pay equity and wage discrimination. BPW/St. Petersburg-Pinellas held our 13th annual “Unhappy Hour” to mark Equal Pay Day on April 12, 2016 at the St. Petersburg Museum of History on downtown St. Petersburg’s beautiful waterfront. Approximately 70 people attended this year’s Unhappy Hour, including students from the University of South Florida Womens’ Empowerment Club. Part of our event’s mission is to make younger women aware of the ongoing relevance of BPW’s platform issues, particularly pay equity. BPW/St. Petersburg-Pinellas was presented with a proclamation from the Pinellas County Board of County Commissioners, declaring that April 12th was officially “Equal Pay Day” in Pinellas County, and the proclamation was read to the assembled guests by Pinellas County Board of County Commissioners Chairman Charlie Justice, who also pledged the county’s full commitment to working towards equal pay for women. A second proclamation came from the city of St. Petersburg, and was presented by Sally Everett, the mayor’s Director of Legislative and Intergovernmental Affairs, who spoke of the city’s commitment to partnering with organizations like BPW to make economic empowerment for women and their families a priority in St. Petersburg. For photos of Unhappy Hour 2016 click here.